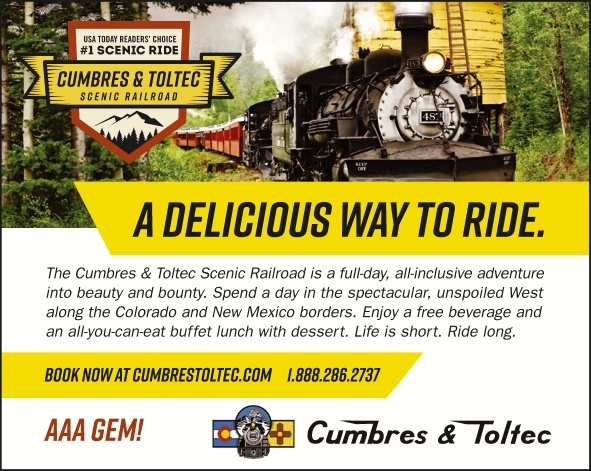 Cumbres & Toltec Scenic Railroad trips depart from the Antonito Depot at jct. US 285 and SR 17. Built in the 1880s, the line connected commercial outposts and mining camps in the Rocky Mountain region and was part of the original Denver & Rio Grande railway system. The 64-mile line, jointly owned by the states of Colorado and New Mexico, has departures from both Antonito, Colo. and Chama, N.M.
All-day trips on vintage, narrow-gauge, coal-burning steam trains afford spectacular views of the scenic San Juan and Sangre de Cristo mountain ranges. Passengers may choose from three types of class: coach, tourist or parlor. The parlor car offers refreshments and the services of an attendant. Osier, an old stagecoach stop, is the transfer and lunch point. From there, guests can choose to continue on by train to Chama or return to Antonito. Various combinations of train and motor coach transportation are offered; all trips include lunch. One-way and sunset dinner trips also are available. AAA offices in Colorado and New Mexico can make reservations. Round-trip, coach-class train or one-way, coach-class train with bus return $99.75; $49.75 (ages 2-12). Tourist-class fare $155.75; $79.75 (ages 2-12). Round-trip parlor car fare $195.75. All fares include lunch. Children are permitted in coach and tourist class only. Reservations are recommended. Round-trip train excursions depart from Antonito and Chama daily at 8:30 a.m., late May-late Oct. One-way train excursions with bus return depart from Antonito and Chama daily at 10 a.m., late May-late Oct.